I've been in the recently redecorated Joplin, Missouri, for the past month and greatly preoccupied with family post-tornado matters, but I have had a chance to observe nature through the coming and going of Brood XIX of the periodical cicadas in nearby parts of Missouri and Arkansas. 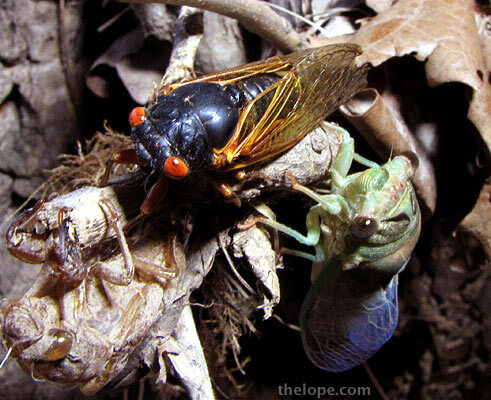 Periodical cicadas emerge in their adult form only every 13 or 17 years - 13, in this case. They pop up in the Spring and are ideally suited for it, with their black, fast-heating bodies. A few of them were still around in Jasper County, Missouri, a couple days ago and I managed to grab one and pose it with a just-moulted annual cicada. Annual cicadas come up every year. So here's my own photo of a rare and special changing of the seasons. I placed a Spring cicada, (Magicicada tredecassini), on a branch at the base of a tree where a Summer cicada (Tibicen pruinosus) has just moulted into its adult form in Joplin, Missouri. The M tredecassini is near the end of its life and actually came from near Jasper, Missouri, in the same county as Joplin. I believe I have heard them in Joplin but have not managed to capture one here. The two coexist over a wide range so this scene, though fleeting, should not be unnatural this year. We can probably look forward to hearing some Summer cicadas well into the Fall. Indeed! Here in Jefferson City, our periodical cicadas are getting fewer and fewer--but Sunday evening I heard some Tibicen pruinosus/scissors grinder cicadas calling in the trees. Pretty soon our cicada killer wasps will be out, too!